Trips described below help to provide an idea of potential student-created Leadership Academy trips during the 2018-19 academic year. Society often tells us that politics is among the few things that we should never talk openly about in public. Politics Through the Looking Glass offers students the ability to recognize biased-based division and the significance of collaboration in politics. Through contact with the offices of U.S. Senator Cory Booker and Congressman Tom MacArthur, we were able to obtain access to view the House, Senate, and Congress Gallery debates, research documents at the National Archives, and receive a docent-guided tour of the Library of Congress and the Capitol Building. Students will explore what contributes to the formation of the divide among political parties and the aspects that help and hurt a successful debate. This will give students the hands-on opportunity to view how collaboration in politics works to make beneficial decisions. 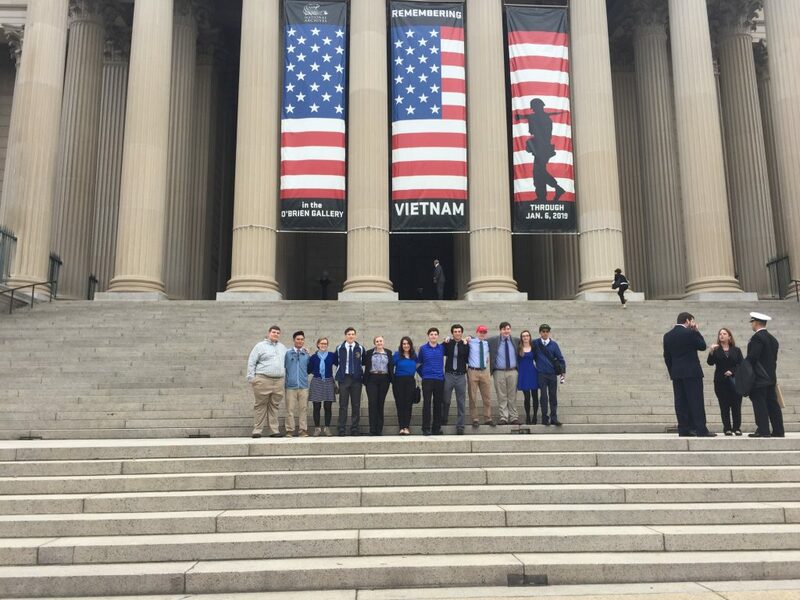 Through various tours, students will see how the history of politics has developed over time. Not only will students be able to understand the learned concepts and recognize the confirmation bias in the classroom, they will be able to recognize them in real life and be able to communicate what they have learned to others. They will then come together to craft a system for how they believe people can see their differentiating ideologies as an asset rather than a threat and truly collaborate for what is best for the common good. Students will explore their political affiliation and discuss with peers the differences in the values and principles behind each party. Students will then learn about the confirmation bias. The confirmation bias is a human tendency that causes people to notice, remember, and give greater weight to evidence that confirms their values and beliefs, and at the same time fail to notice, remember, and give less weight to evidence that contradicts their values and beliefs (Nickerson, 1998). Students will learn how the confirmation bias causes people with different political ideologies to not only disagree but at times see the other sides as ignorant or evil. This is known as naive realism. On the Bus Ride students will listen to multiple Democratic and Republican political speeches and have students determine which speech was which party and why they believed it was that party. Students will be given the opportunity to take on opposing political perspectives than their own self identified ideology. Students will be given a profile with a list of core values and beliefs and take part in different committees to solve real world problems. 9:45 a.m. – Guided Library of Congress Tour must arrive by 9:30 a.m. The Library of Congress is the research library that officially serves the United States Congress and is the de facto national library of the United States. It is the oldest federal cultural institution in the United States. Students will explore the concept fact vs opinion and discuss the history of “fake news”. Students will examine, and discuss important documents from our nation’s history to see how in the past our nation struggled with similar political divides we are facing now. Students will discuss the impact that new media might have had on division in our country today compared to the period that the documents are from. Students will explore the history of the United States and discuss what were events that united us as a country and divided us as a country. Each student will share how they hope America can unite and how they think that could happen. Students will begin watching the film “Out of Many, One,” which will take them on a journey through our country’s struggle to establish the world’s first truly representative democracy and introduce them to the magnificent building that houses our Congress. Once inside the historic Capitol, they will see the Crypt, the Rotunda, and National Statuary Hall. 2:00 PM Supreme Court Self-Guided Tour: Students will have the opportunity to take advantage of a variety of educational programs including Courtroom Lectures, a visitor’s’ film, and court-related exhibitions. 3:00 PM Workshop 4: Bringing America Together Small Groups on the Mall! Students will discuss in small groups strategies to craft a system for how they believe people can see their differentiating ideologies as an asset rather than a threat and truly collaborate for what is best for the common good. Have you ever wondered what makes sports fans so passionate? Ever wonder what drives people to support their group of sorts, no matter how successful this group is? Social Identity is a person’s sense of who they are based on the groups in which they belong to. The groups which people are included in are an important source of pride and self-esteem. Groups give us a sense of unity, and in order to increase our group’s self-image, we boost its status, while discriminating against other groups. In a way, this is how society acts towards supporting their professional sports teams. During this experience you will learn the social identity theory and how it applies to life, and more importantly sports. Specifically, we will focus on the Philadelphia 76ers fanbase and the “Process” and how that ties into the Social Identity Theory. By listening to Sixers experts, like Spike Eskin, and examining the fanbase live in action, we can better understand why society is so drawn to creating groups and coming together through sports. Spike Eskin is a program director, sports editor, and radio host at CBS Philly and 94 WIP and is the co-host of the Rights to Ricky Sanchez podcast. He is the head organizer of the Rights to Ricky Sanchez lottery party and Retweet Armageddon. This workshop will teach the Social Identity Theory. Introduced by Henri Tajfel, social identity is a person’s sense of who they are based on the groups in which they belong to. He proposed that the groups (social class, family, sports team, etc.) which people are included in were an important source of pride and self-esteem. Groups give us a sense of social identity, and in order to increase our group’s self-image, we boost its status, while discriminating against other groups. In a way, this is how society acts towards supporting their professional sports teams. In order to make our team sound better, we brag about our team while putting down other teams. As these actions are frowned upon in most of the world, it is encouraged in the world of sports. This action is known as in-group (our own) and out-group (the others). The social identity theory theorizes that in-groups will search for negatives about the out-group in order to boost their own image. Some can argue that the best part of sports is the rivalry between two teams who just don’t like each other. In this theory, there are three steps, Categorization, Identification, and Comparison. First, we categorize things in order to identify them and understand them better. Next, we adopt the identity of the group we have categorized ourselves as belonging to. Finally, we compare ourselves and our groups to other groups. In a way, most of us are born into our sports fandoms, and some develop likings outside of the family “beliefs”. Closing Workshop: Students will review what they learned and discuss how this theory was seen in action.